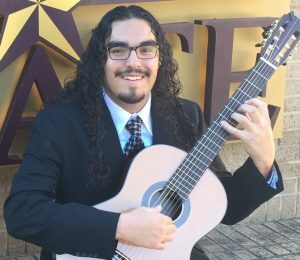 We came to know Francisco De La Rosa in 2009 when he joined the guitar class at Akins High School and began working with ACG’s Assistant Director of Education, Jeremy Osborne. We’re proud to count Francisco, who’s currently a Music Performance major at Texas State University, as one of our alumni. He recently sat down with us to talk about his love for music, and what motivates him to continue playing. At Akins, guitar was more than just a class – it was a second family. And Mr. Osborne was like an older brother, a role model. High school can be a stressful time, but guitar class was my comfort zone. Everyone was friendly, and there was no judgement. We worked as a team. I received a scholarship from ACG to attend Austin Community College. After that, I reached out to Mr. Osborne for some help preparing for my audition for Texas State’s classical guitar program. I’m proud to say I just finished my second year there, and I’m working toward my Bachelor’s in Music Performance. It hasn’t always been easy, but ACG helped me discover my passion and go further with guitar than I ever thought I could. Music completes life for me. It allows me to express who I truly am. When I’m playing guitar, it’s like I’m transferred to a different world. Music is a magical feeling. I step outside my consciousness. When I talk, I can’t always find the right words, but when I play guitar, I can express exactly how I’m feeling.